What if my kids want to get tattoos when they’re 10? My husband and I have two children. Our daughter just turned 6 and our son just turned 12. When our son was younger he would teeter back and forth between saying he wanted to get a lot of tattoos when he grew up and saying he never wanted to get any. My husband, who is a tattoo artist, spent many nights “tattooing” him with markers. My husband has also done the same for our daughter; legs, arms, hands – and she is sure that her first tattoo will be a “chubby ballerina girl”. Kids are so cute! I waited until I was 18 to get my first tattoo. My husband, well he’s a different story. He was tattooing himself with a needle and thread when he was a teenager! 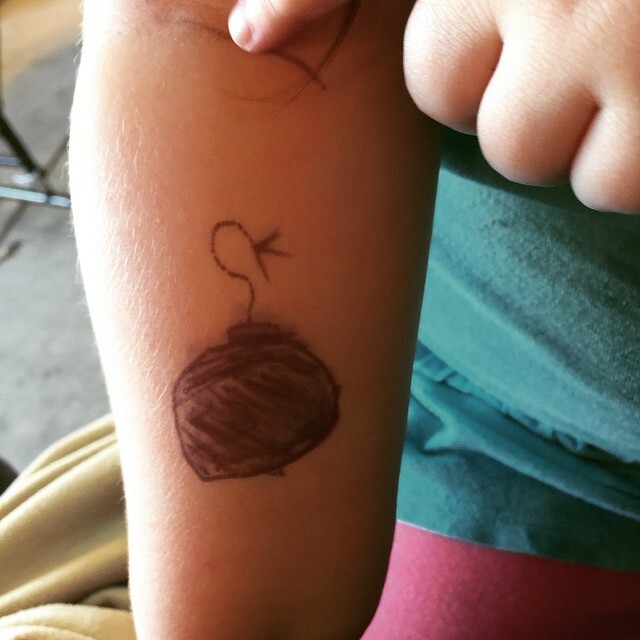 We have made it clear to both of our children that we support their choice to get or not get tattoos – whatever they want! We don’t expect them to be heavily tattooed just because we are. We’ve also made it clear that they will both wait until the legal age to get tattooed which, where we live, is 16 (with parental consent). Surprisingly, both of them have said they want to wait until they’re 18! I found this article over at Rebel Circus that touches on the same subject: http://www.rebelcircus.com/blog/tattooed-mom/. Although the article was written (exactly!) 4 years ago I feel that it is definitely still relevant. Tattoos may be even more mainstream now than they were 4 years ago but, there is still judgment. Children get used to the people they grow up with, so chances are that your children will judge being heavily tattooed as the norm, and having no tattoos as a weird thing. What are your thoughts? Have your kids asked you if they can get tattoos? What are your guidelines for when they are old enough to get a tattoo? I’d love to hear your thoughts on this subject!! Want to start a conversation of your own? We’d love to have you as a contributor to the blog! Fill out our contributor form and we’ll be in touch! Prev post Featured Tattooed Mom: Casey G.
Next post Sign up for our newsletter!